Let's talk about phone books. I was going through some cupboards as part of my 2011 in 2011 challenge and I found 8 of them in there. As I was sorting through them I realized that there is 2 per year by 3 different companies. Why is there 3 companies producing phone books??????? Do we really even need phone books anymore? The only thing I like it for is the menu's in the yellow pages. So we will be opting out of receiving phone books from now on. 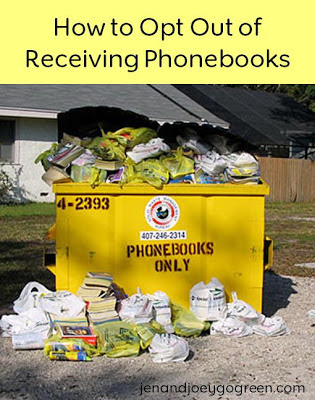 If you want to opt out of receiving your phone book here are some resources to help. Have you opted out? How did it work for you? Thanks for the link! I hate receiving those because we never use them. Opted out too! Thanks for the links. I didn't realize, but apparently there are 4 printers that service our area. No wonder we were getting so many yellow pages!! I asked all to stop. Wonderful post. Thanks for the useful information!